The Complications Of Getting Running Water In The West Bank : Parallels Rawabi, a privately developed Palestinian community, sits in the West Bank. The first residents are due to move in later this year, but its developer is worried about water. To get a pipe laid, Rawabi needs Israeli permission. 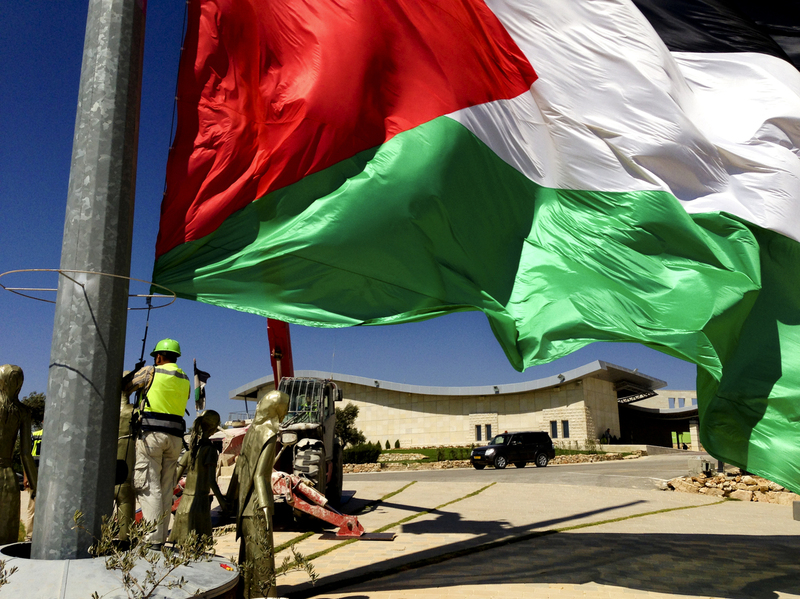 Israel has cooperated, but the Palestinian developer says the cooperation has been "very slow and always incomplete." Big green storage tanks hold water for the planned Palestinian town of Rawabi in the West Bank, where water is often a source of contention. Four enormous water tanks sit high on a hill in the West Bank. These hold the lifeblood for Rawabi, the first planned, privately developed Palestinian community, about 25 miles north of Jerusalem. After five years, the first neighborhood is nearly built. But developer Bashar al-Masri is worried, because when it comes to water, Israel controls the spigot in the occupied West Bank. "We're about to have people move into the city," he says, "and we still do not have a solid solution for the water." Right now, a 2-inch temporary pipe brings in less than half the water needed for construction and to run the offices. The rest is trucked in to those storage tanks, an extra expense and hassle. Rawabi's first residents are due to move in at the end of this year. 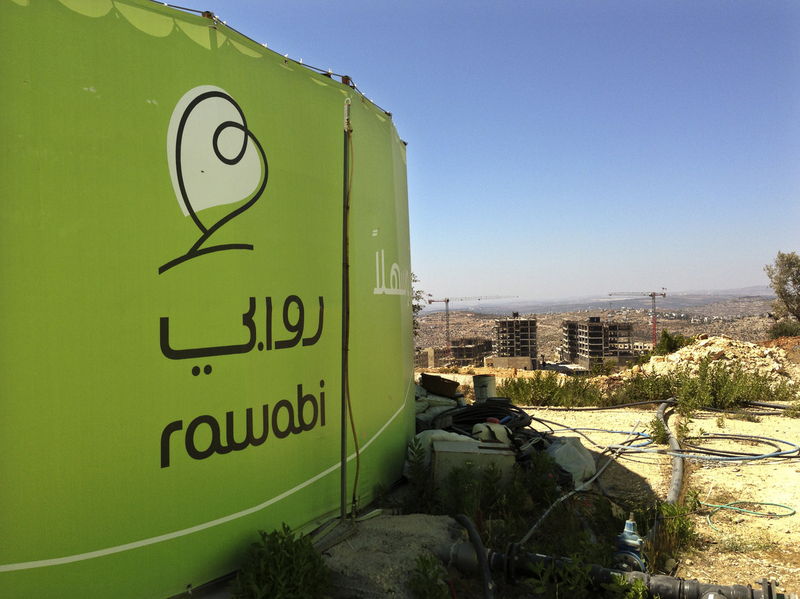 Eventually, developers hope, 40,000 people will call Rawabi home. 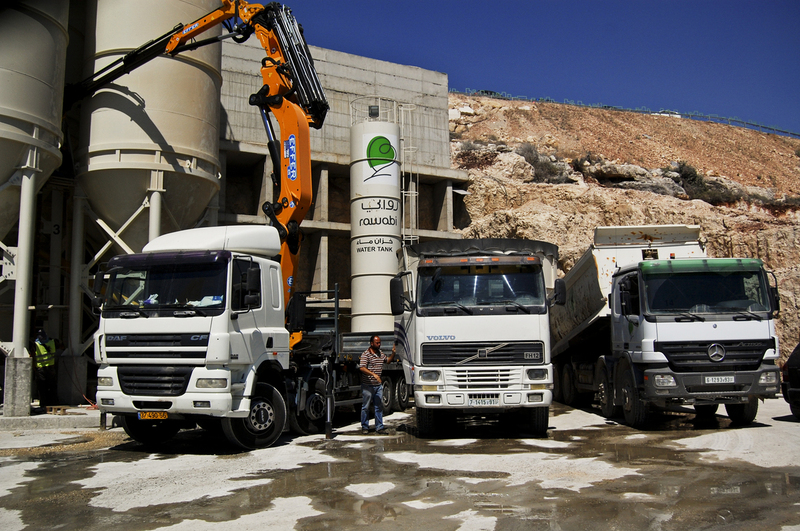 Cement mixers in Rawabi, a planned Palestinian town in the West Bank, about 25 miles north of Jerusalem. They also hope this will be a new kind of living experience. Rawabi is designed to offer an environmentally friendly, middle-class lifestyle. There will be walking and biking paths. Like in Israel, but unlike in any other Palestinian city, wastewater here will be cleaned and reused to irrigate landscaping. Homes will have meters to help monitor water use and instant hot water to reduce waste. Amir Dajani, the deputy managing director of the project, says these are big cultural changes. Most Palestinian homes have their own water tanks on the roof, because in the West Bank water comes through the pipes erratically. Some places get it several times a week; some places less than once a month. "People hug their tanks in the summer," Dajani says. "If they go up on the roof and feel the tank, they know that there is enough water to keep them going." To get enough water to keep Rawabi going, a new pipe needs to be laid. And because that pipe would run across territory entirely controlled by Israel, in what's called "Area C" in the West Bank, the community needs Israeli permission. 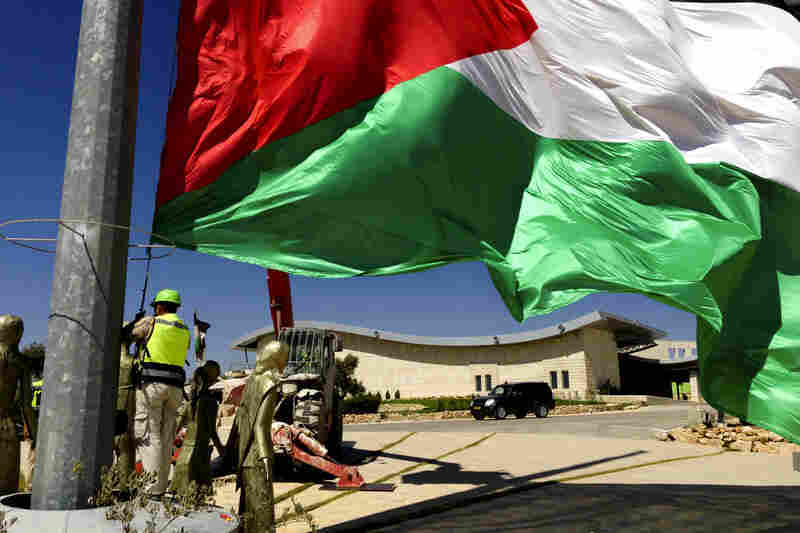 An application is in to a joint Israeli-Palestinian commission. But Israeli water expert professor Alon Tal says it's a lopsided relationship. "Israel doesn't need Palestinian permission to undertake any number of water development projects," he says. "Palestinians are required to get Israeli permission to do so." But he says he believes Rawabi will get its pipe. "I think all the major decision-makers, including our prime minister, see Rawabi as a good thing," says Tal, who supports the idea himself. 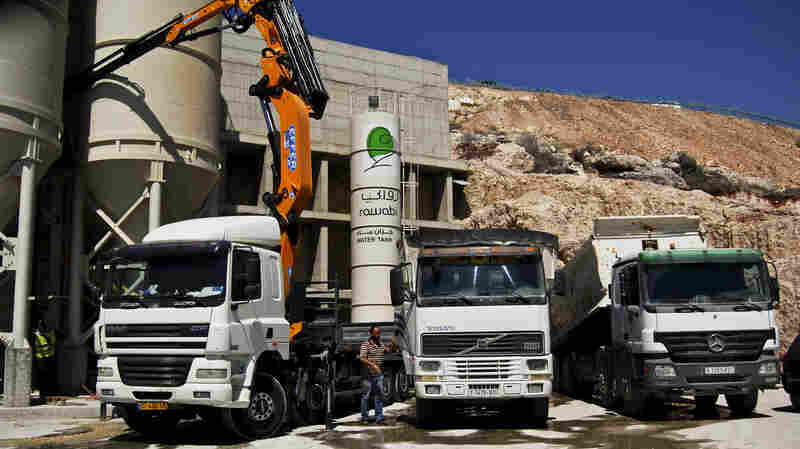 "It sends a message to the world that Israel's not trying to sabotage Palestinian development. It sends a message to the Palestinians: It pays to cooperate; we're going to let you guys develop new cities. "It's the first city in the West Bank in what, 100 years?" Developer Masri is not so sure. "We have had positive feedback from the Israeli authorities since day one," he says. "But the delivery is very slow and always incomplete. Always incomplete." As an example, he points to Rawabi's attempt to get a road built to the city big enough to handle, first, construction traffic, then residents. The road also crosses part of Area C.
Palestinian flags at the top of Rawabi, where residents are planning to move in shortly. Israel eventually permitted a temporary road. A Western official told NPR that Tony Blair, the former British prime minister who now serves as the official envoy of the Mideast Quartet, had raised the issue with Israeli Prime Minister Benjamin Netanyahu. Tal, the Israeli professor, says the question of Rawabi's water could also get caught up in politics — even in peace negotiations, if they begin. "Israel grants a certain amount of water, under agreement, to the Palestinians," he says, noting that the amount Israel provides the West Bank has grown since figures were first worked out under the Oslo Accords two decades ago. "It's very easy for us to increase that. But that's a concession. What are they going to do for us? At least this is the thinking of Israeli politicians," Tal says. U.S. Secretary of State John Kerry is pushing a $4 billion economic investment plan for the West Bank, to parallel potential political negotiations with Israel. No details have been made public, but Kerry has spoken about removing "bottlenecks and barriers" to business in the West Bank. Experts in the West Bank economy say allowing development in Area C could be an important piece of that. 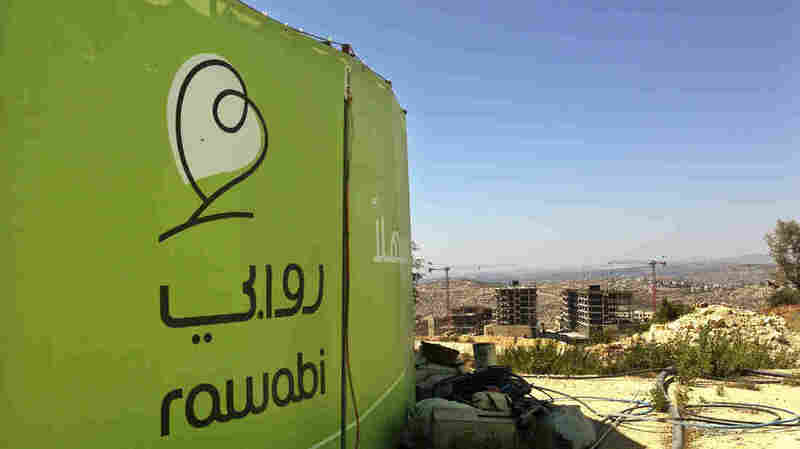 Rawabi's developer says even if Israel gave the green light for a water line right now, he would expect to continue hauling water even as early residents move in. "But whether we haul it for three or four months or three or four years — that's the big question," he says.